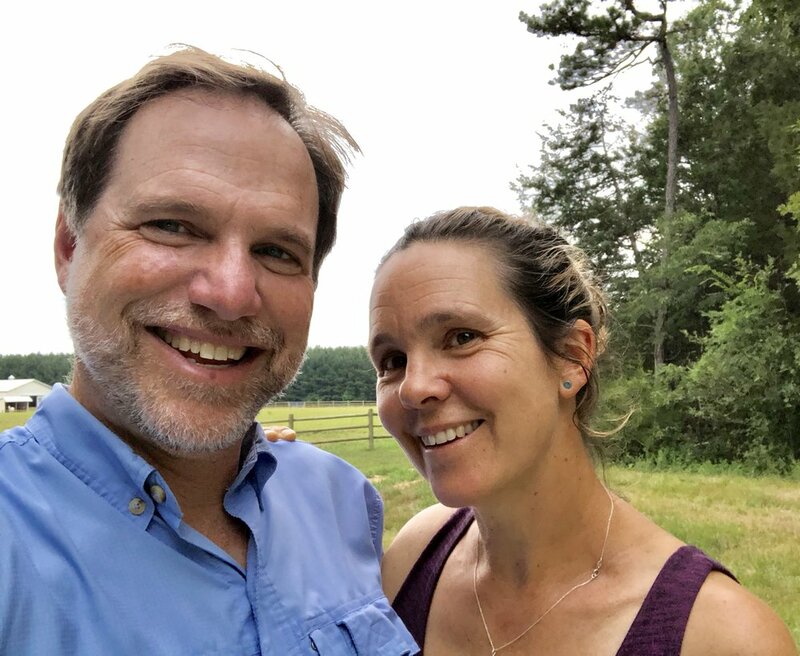 Clearwind Farm was created in 2000 by Suzanne and Matt Case, a wife-husband team who have grown the farm while also raising their blended family of four children. We have moved locations and evolved our approach over the years, and in 2018 built our own facility at 7961 Scenic Trail, Chapel Hill. We will continue to evolve our programs and projects, and look forward to partnering with like-minded individuals and agencies in the area. Suzanne Case runs the farm, teaches riding lessons and yoga, and is the equine specialist for psychotherapy sessions on the farm. She has been working with horses for over 35 years as trainer, teacher (BHSAI certified instructor), rider and caregiver. Her deep belief in the connection and understanding between horses and people has led her to care for horses and co-facilitate equine assisted psychotherapy (EAP) sessions. Suzanne is certified by PATH International and Eagala and co-founded Vinyasa Dressage. Matt Case is a Licensed Professional Counselor and has been counseling children, adolescents and adults since 2000 in private and community-based settings. He was drawn to using horses in psychotherapy because he saw how it brings to light peoples’ struggles and strengths with an ease and clarity he seldom sees in traditional office-based psychotherapy. Matt’s therapy style draws largely upon mindfulness and acceptance approaches, empowering clients to create rich and meaningful lives by unhooking from undermining thoughts and feelings and taking action towards their values. He also sees clients at his office in Chapel Hill. Jill Taylor, co-founder of Vinyasa Dressage and longtime friend of Suzanne, is a riding and yoga instructor at ClearWind Farm. She is also the Strategic Business Director for a large wellness company. Jill creates and organizes special events on the farm such as yoga workshops and leadership learning. She and her husband Todd help take care of the farm and Todd’s wonderful wood working can be found throughout the facility. Amanda Graham, MS, is a Licensed Professional Counselor and Advanced Certified Eagala practitioner who believes that people have an infinite capacity to change, evolve and grow when given the right environment and the right tools. With a client centered, solution focused approach, Amanda has spent thousands of hours creating a safe environment for people of all ages to face some of their most challenging moments and to find resolutions that work for them. She also has a history of working in executive leadership, and has facilitated organizational development and learning programs, helping work teams find innovative and long-lasting solutions to their pain points. Amanda finds a kinship with ClearWind Farm through their mutual experience and commitment to equine assisted learning and therapy, and is grateful to be a part of their team. You can learn more about Amanda at her website. James Jefferies is an experienced horseman and barn manager whose warmth, professionalism and expertise add an additional dimension of comfort to the farm. The farm could not run as well as it does without his dependability, work ethic and calm manner. He has been a cherished friend and has worked with Matt and Suzanne for nearly 16 years. Sadie Hoffman is a superb animal handler and barn hand whose attention to detail and steady work ethic bring a polish to the facility making it all the more welcoming to horse and humans alike.